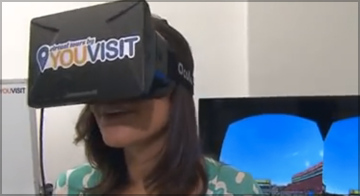 WATCH: Should you take your next college tour using an Oculus Rift? You may remember the news from last year, when Facebook bought virtual reality company Oculus Rift for a cool $2 billion. But here's something you probably didn't know about the Oculus Rift technology. There's a company out there called YouVisit that's starting to offer virtual tours of college campuses using these amazing headsets. Sound a little crazy? Watch the video below and make up your own mind. We'd love to hear your thoughts. Would you take a college tour using an Oculus Rift?